Things are a bit wonky, and sometimes there's a small square hovering next to my right eye. And then I look up, and some time has passed, and someone's crouching next to me. I have epilepsy. The above is pretty much how I experience seizures, although they're very different for the people around me: they last from 5 to 20 minutes, and sometimes I do strange things like tell my long-suffering flat mate that 'the carpet is walking'. They're not the kind of seizures that spring to mind for most people when they hear the word epilepsy - and rather than flashing lights, they're usually triggered by stress. I practised yoga before I was diagnosed three years ago; but after finding out that my brain has a penchant for electrical malfunction - and that my biggest trigger for seizures is stress - asana and meditation became a much bigger part of my life. From hours of following mysterious Internet trails to obscure places, it seems that research into the usefulness of yoga for dealing with epilepsy is limited, and poorly referenced. This isn't surprising, given that the condition itself is so variable from person to person and so little understood. For me, consistent yoga practice plays a huge part in handling my seizures every day. And because of this, I'm confident it can help others, too - if not by physically reducing seizures, then at least by making it easier to get your head round them and accept what's going on with your body. Having discovered that it was emotional stress that made me most likely to start twitching all over the place, I turned to my yoga practice which had, until then, been sporadic. I began to practise five or six days a week and very quickly felt the difference; I was calmer and, quite simply, had fewer seizures on days when I practised, than on days when I didn't. 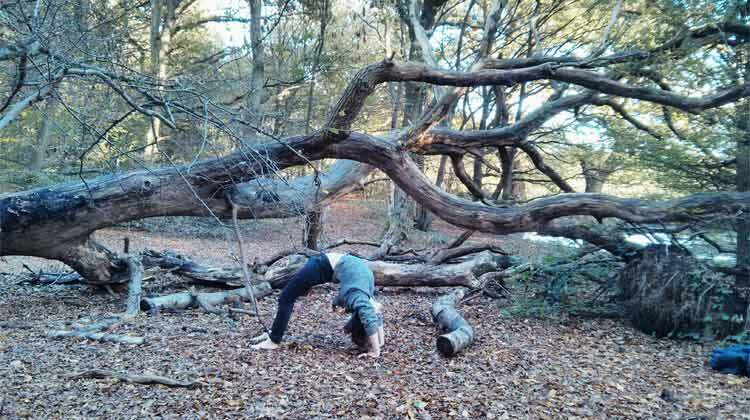 As time has gone on, yoga has also become a way to handle the after-effects of seizures; they sometimes turn me into a bit of an emotional monster, and I've developed a post-seizure sequence of asanas and pranayama exercises that really do work when I'm feeling particularly monstrous. Perfect for if you're feeling a bit unsteady or anxious, Balasana is an awesome stress reliever and can be reassuring if you think you might have a seizure soon. It's also a really lovely, gentle stretch for the hips, back and neck, and may be helpful if you experience pain after seizures. Balances the left and right sides of the brain and calms the nervous system, which could play a part in seizure control. I do 10 rounds as part of my morning practice. Always part of my post-seizure practice, this pose lengthens the hip flexors whilst giving space to breathe into the body and check in with how you're feeling. For me, headstands bring a sense of strength and independence which help to counter anxiety surrounding seizures. There's something about the openness and freedom in this pose...it never fails to make me smile! I now teach yoga asana, and my experience of epilepsy makes me very aware of the impact that a few casual words could have on the confidence of others with particular health conditions. In the first yoga class I went to after I was diagnosed, I told the teacher I had epilepsy and she said "ah, so you mustn't do any inversions." In another class, a teacher asked me to wait in Savasana (Corpse pose) while the rest of the students were doing pranayama practice. Whilst these teachers meant well, both of these instances left me afraid for a number of months to go upside down or to do any strong breathing exercises. When I finally mentioned it to my neurologist, he said there was no reason why I shouldn't be doing those things, as long as I was aware of what was going on and stopped if anything didn't feel right - as in any other situation. Because epilepsy led me to do more yoga, read more about yoga, and to train to teach asana and - hopefully! - help a few other people on their way to making yoga a bigger part of their own lives, it has shown me that this kind of magical practice that we love has the power to turn difficult things into positive ones. And that's a pretty special power.